Liberals and Progressives are really into labeling American Whites as racists, all the while ignoring and/or denying their racism which, in point of fact, is more endemic and more pernicious than anything that has been been displayed by any measurable number of Americans for more than a generation. Theirs is the racism of lowered expectation and the caretaker mentality that goes with it. Note that this racist attitude is nothing new and has been used as an excuse for far greater harm than the modern Liberals and Progressives attempt. Rudyard Kipling’s poem, while fully steeped in the Colonialism of the 19th century, still describes “White Man’s burden” that the Liberals and Progressives want to foist onto all of our shoulders. 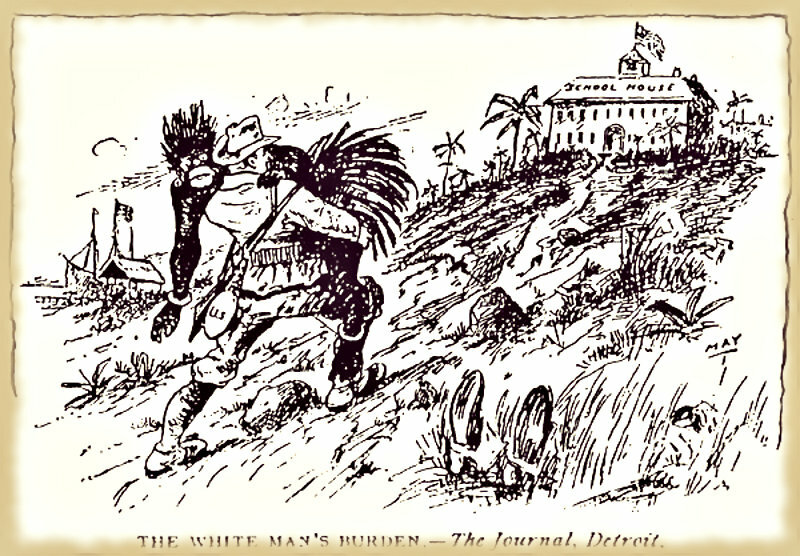 It may be politics, legislation, and activism in these times instead of war and “benevolent” conquest, but the underlying sentiment is the same – that the White Man must bear the burden of tending and “raising” the various minority subcultures in America. The only fundamental differences are that this is now a domestic effort instead of foreign adventure, and what was an excuse is now the sole reason for shouldering the burden of these sullen people. No, the dear-bought wisdom of a bygone age was frittered away and lost upon the Liberals and Progressives. Yet, times and Man do not truly change and one need only look to Africa or to Detroit to see what this shadow of Colonialism will lead to in its inevitable failure. This entry was posted on Tuesday, August 20th, 2013 at 4:40 pm and is filed under Politics, Society. You can leave a response, or trackback from your own site.